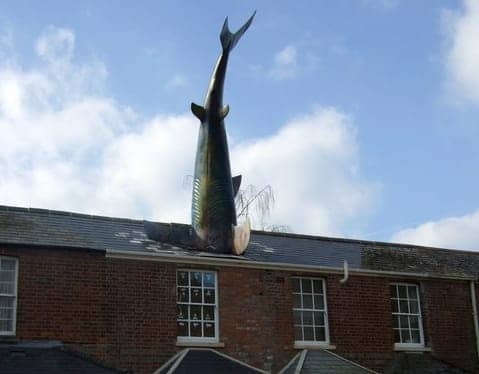 The Headington Shark is an oversized shark embedded head-first in the roof of a house at Headington, Oxford. Made of painted fiberglass it was designed by sculptor John Buckley and constructed by Anton Castiau in 1986. Reported to weigh 200 kg it is 25 feet (7.6 m) long. The house owner has said 'The shark was to express someone feeling totally impotent and ripping a hole in their roof out of a sense of impotence and anger and desperation... It is saying something about CND, nuclear power, Chernobyl and Nagasaki'. The shark was controversially allowed to remain after a planning appeal.